In a typical standalone WPF application, the new project wizard will generate XAML for your main Application object, as well as for any Window-derived objects that you create. 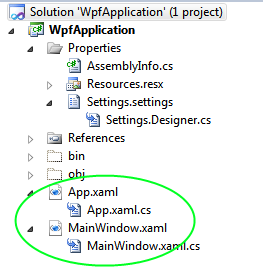 You can see two .xaml files in a simple WPF application in the Solution Explorer. There is a single .xaml file for each top-level UI type that can be instantiated in XAML. Each also has an associated C# code-behind file, which will contain the C# implementation code for the same type. If you double-click on one of the .xaml files, the XAML code for that object will be shown on the XAML tab of the Designer window.